One of the newer features on the platform is the "Store Testimonials" feature. This will allow customers to relay messages to the admin, describing the how they feel about the site. The admin can choose whether they would like to display these messages. There are a couple options you'll need to be aware of before we move on. In Settings > Store Information > Store Testimonials you have a couple options. You can enable the feature here. You can choose to make the customer log in before they can submit the testimonial. Another option is to choose whether the admin needs to approve the comment before it is live on the site. Additionally, you have options for sending an email to the customer whenever they submit the testimonial. This can also be sent to the admin by editing the email template, and putting more information in the admin section. By default, there is a store level page, located at yourdomain.com/store/storetestimonials.aspx . The testimonials will show here by default. However, you can optionally place a widget on the site to display the information elsewhere. You will first need to decide where you would like to display the store testimonials. For the purposes of this article, we will be using a content page. First, you will want to create a widget on the page you would like this to display on. This example uses a content page, so we went to Themes > Edit Theme > Content Page (base) > Widgets. Here we created a "Store Testimonial" widget. Immediately after creation, I checked the option to Enable Merge Code. Now, copy the merge code to the clipboard. After this, I am taking the widgets merge code and placing it on a content page. 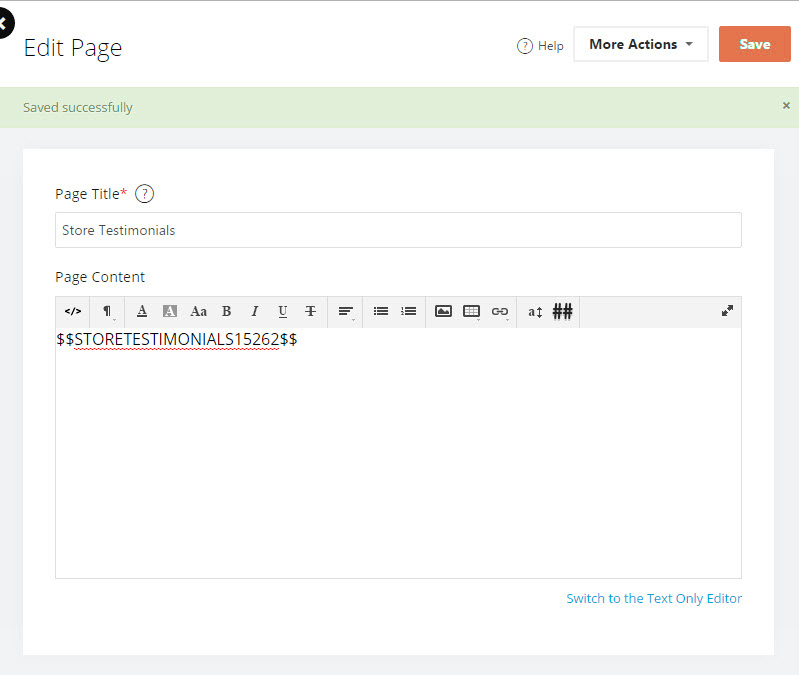 After saving, the store testimonial widget will appear onto this content page. Customers viewing the widget have the option to add a new testimonial. However, an admin may need to approve the testimonial first. To do this, you will want to go to Content > Store Testimonials. Here you can edit a testimonial from a customer, or create something new. Edit the testimonial, and you should see a section labeled as "Approval Status". 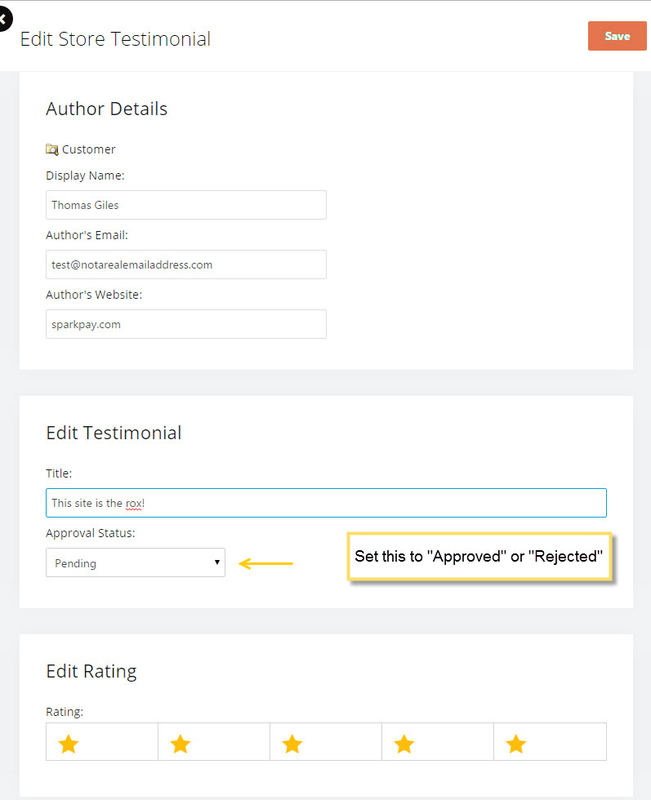 Change this to "Approved" or "Rejected", pending on if you want the testimonial to show up. NOTE: Sometimes you will see HTML tags inside the post. At the bottom of the edit testimonial screen, there is an option Display this Testimonial Body as HTML. Enable this, and it will render this as HTML instead of plain text.